Stand up comedians have probably one of the most nerve-wracking jobs around. With not even a microphone stand to hide behind, it’s a tall order to feel so at ease with your audience as large as the palace. 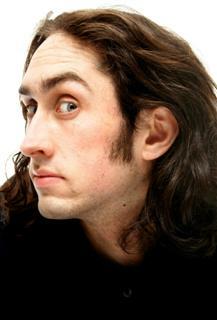 It’s a hard art to master; one man who’s got the hang of it is Ross Noble. After quite a disturbing short film about rules in the palace, Ross bounds onto the stage with bags of energy, immediately getting to know his audience. Already two minutes into the show and he already established that a small Indy band and a female snooker player have run through his show to get to a snooker tournament. Bizarre? Yes, funny? Without a doubt. Over the course of the evening, Ross talks to us about wars between chavs and Westlife using spuds from spud-u-like as weapons, bum-faced kids at the zoo and Gary Glitter’s death penalty. Don’t be surprised if you find that another night of his show is different to the night I am reviewing. You can tell that a good part of Ross’s shows are improvised and no two are exactly the same. Ross constantly makes friends with members of the audience for no particular reason. His style is so different to your typical grumpy bloke reading out the same script each night. Like in music, when you are different it can fail miserably, or be a massive success. Ross also has the great ability to be offensive and get away with it. He loves the fact that some of the audience are slightly shocked when “makes a joke about Muslims and replies by saying I’m not having a go at Muslims, I’m just saying that they’re equally as retarded as every other religion.” Instantly a cheer goes up. Another quality Ross has is his imagination. At one point in the show, Ross is running back and forth across the stage, pretending to ride a number of different animals: “I’m on dolphin!” he shouts as he skips across the stage. As a finale Ross tries to pack in all of his jokes over the evening into one mime involving keepy-uppies with an owl. Ross spends ages organising the sequence, even getting one of the members of the front row to head the imaginary owl back to him. If you get the chance, go and see Ross. But try and be open minded. If you are, you’ll love his liveliness that is so hard to find in comedy today.